Hello and happy new year and thank you for this great gift! 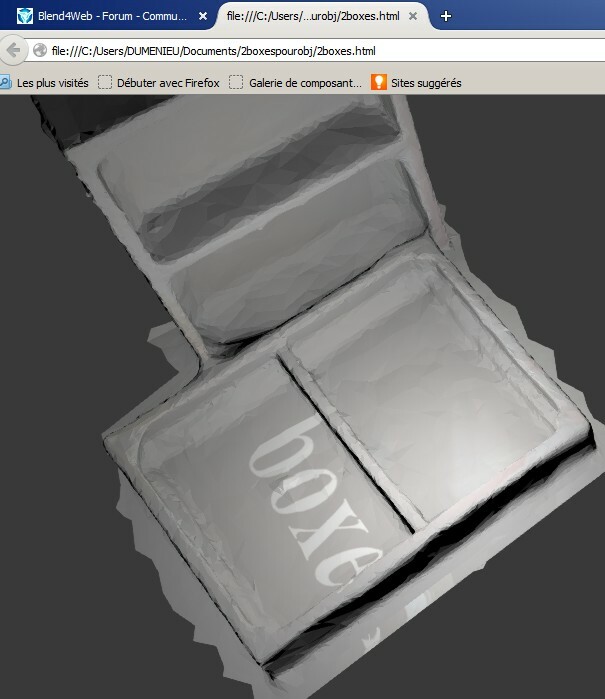 I just try it and I have not the texture of my obj file, in the html page I exported. Don't know if it is an blender issue or a blend4web issue. Anyways i am not good at blender , but your no pluggin way is GOD! how to export both the shape and the texture in the html page ? Hi Alain and Happy New Year! Maybe a format issue? Make sure that your image is PNG, JPEG or GIF. ok Thank you very much , I must go now to an airport , and will be back tomorrow or on sunday , and I will re check all. Well , I dont think that it is a blender texture issue, because if I test to export to obj I have the texture. but I have none main.json file in my folders. still Missing after I installed the adon ??? HTML export option implies that you get standalone HTML files, without any external dependencies. Could you please attach here an example file for me to take a look? Thanks! and here my stuff , thanx to test , thank you in advance !